Artificial Intelligence was also a hot topic back then so of course that became a part of the mix. I thought corporations would probably use increasingly more advanced AIs to control their virtual worlds and shopping experience. Inevitably something in the programming would fail and virtual shopping could become unintentionally lethal. All of this would amalgamate into a virtually reality experience that seems so real and immersive that participants would never want to leave their house. They'd simply plug themselves into a computer with their VR headset and waste hours hooked into 'the machine', spending real money on ones and zeroes. Virtual shoes, virtual clothes, virtual experiences etc. 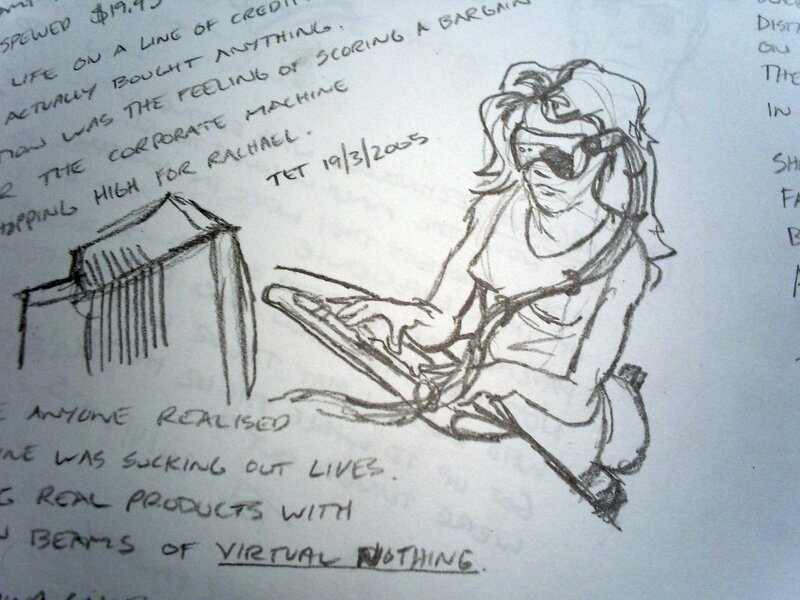 My ideas would emerge around March 2005 as a series of nine short, poetic monologues, each telling a small part of the new world of VR addiction and corporate manipulation. Only two of the monologues made it to a finished art piece. The first monologue, called 'Rachael', which I recorded as a performance video (below) back in 2008. The video was intended to be part of the first chapter of a blog I started at the time to feature the monologues and a much more detailed story tying them all together. That blog is now my Animation and Video blog but the first and only post of TET Reloaded, Shopping at Maceys, still exists complete with the opening story. 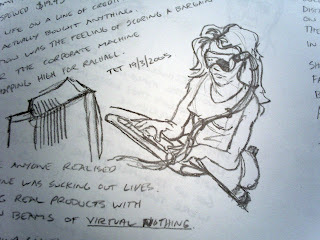 The accompanying sketch (above) shows Rachael with her Oculus Rift style VR headset plugged in to her computer. Keep in mind that although VR had tried and failed in the 1990s, by 2005 there wasn't really much happening in the mainstream world. 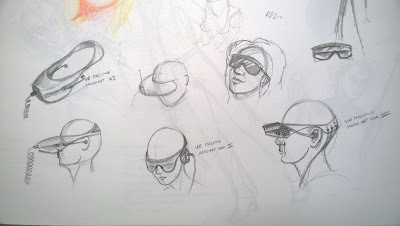 At the same time I began sketching my ideas for VR Headsets in preparation for my first image illustrating the fourth monologue that continues the story of Rachael. VR Headset ideas by me in 2005. Most of my headset designs are wired to match the lines in the monologue but if you look at the designs they're not unlike some of the headsets around today. Not that I'm saying I'm a forerunner to any of the current designs. It's not exactly a stretch of the imagination to plan a headset that obviously will need a screen placed in close proximity to the eyes but I'm not too far off what we have now. Probably the only real difference is I didn't foresee mobile phone screens would be the driving force behind affordable VR head wear. Heck if you have a modern mobile phone you can enjoy VR with Google Cardboard - probably the cheapest option. Phones don't just provide the ideal screen size for a headset, they also include all the necessary gyroscopic and geo-location features required by VR to keep your orientation accurate in the VR world. Currently VR is gaining much momentum. 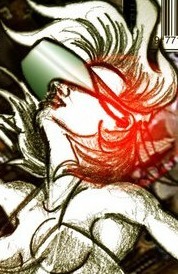 Could we be heading to VR Armageddon? Not in the immediate future but something like the scenario outlined in my fourth monologue, titled 'Stealing', is not that far fetched. See and read the artwork below. But this is what everyone wants. To be at one with a fantasy. Revenue Raisers for corporate giants. The money sucked out of your life. It's certainly a little bleak but shopping yourself to death in a VR world sounds a lot more fun than being enslaved by our machine overlords post singularity. Who knows where VR will lead us to? Hopefully something better than all of us choosing VR over real life. Unlike reality, VR can be like a cartoon... anything is possible. That's a drug that's easy to become addicted to.